Send video signal from an existing desktop computer or another source device with a DVI-D video output port to a projector or monitor with a VGA input. This converter is an ideal solution schools, conference rooms, or other workspaces when connecting to a monitor or projector. There is no need for an external graphics adapter or extra converters. 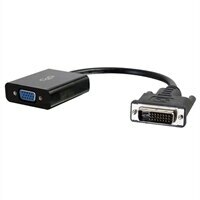 This simple plug and play converter changes the DVI-D output signal to VGA, no drivers are required for install nor additional power adapters. The dongle style adapter reduces strain on the video port. The cable between the DVI-D connection and the converter provide strain relief that protects the port from stress damage as cords are moved. No need to utilize a power adapter. The DVI to DisplayPort converter pulls power from the DVI-D port bus power. If the source DVI port does not supply enough power there is a USB Micro-B port on the converter which offers an alternative source of power.